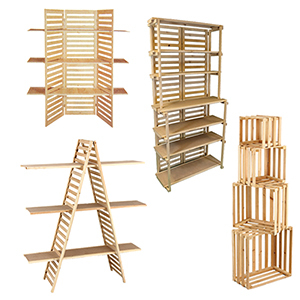 Nested Display Crates, 9", 12", 15", 18"
Set of 4 - 9", 12", 15", 18"
Dimensions: 9" Deep 9", 12", 15", 18"
Display Panel with 3 Shelves, 60" x 14.5"
Display Bakers Rack, 32.5"(L) x 15"(W) & 10"(W) x 70"
Dimensions: 32.5" x (15" & 10") x 70"
Improve and renovate your business with Wooden Shelving Units with a rustic design. Wood displays are quick and easy to assemble, while relocating requires no tools. American Retail Supply has Wood Displays made of Birchwood which last for years to come. Our wooden displays fit perfectly with bright colored products like apparel, jewelry, plants, dishes, and many more. Call to find out what we have in stock, ready to ship today, 1-800-426-5708!